I haven't held a Wii U in more than a month. I hadn't even watched videos of myself playing it. But I just watched a bunch, as I tried to make sense of what Nintendo is trying to accomplish with its next big video game machine and as I endeavor to figure out just how much danger they're getting themselves into. In the videos (like this one) I see myself holding what I now recall was a surprisingly light and comfortable game controller. The controller has a big screen in it, the most radical feature of the Wii U. I have fun in these videos, which helped me remember that the company of Super Mario Bros. and the original Wii usually knows how to deliver fun. I also see some more smoke and mirrors when I watch these videos now. I see that the Wii U games that I played at the E3 gaming showcase in Los Angeles where the 2012 system debuted in June were strange, one and all. These game demos prove that the Wii U is an interesting and enjoyable new gaming console, and they suggest—by both what they were and what they were not—that the Wii U is the most radical device Nintendo has yet created. They also position the Wii U, oddly, as a contradiction of the things that made the Wii so popular. And here's the other wild Wii U idea that I can't shake: For all its apparent faults, the Wii U may be the signature video game machine of our times, the product of an era in which we complement the ordinary activities we do in life—eating, walking, waiting on line at the supermarket, playing video games on a TV—with the twitchy habit of glancing down at an extra screen that we hold in our hands. The controller feels surprisingly compact, even though it forces its user to hold their hands farther apart than any standard game controller ever has. It's skinny and streamlined, mainly because of Nintendo's surprising decision to release a home console controller without analog sticks. They popularized the analog stick with the Nintendo 64 controller in 1996 and those mini-joysticks have become as essential as buttons on every game company's controller since. Nintendo, however, is offering twin "circle pads" on the Wii U controller. Those are disc-like sliders with analog give but no protruding stem, the same design as the pad on the Nintendo 3DS. "When we thought about having this controller in someone's living room, we kind of looked at it from a stylistic perspective," Katsuya Eguchi, a senior video game designer at Nintendo, told me last month. "Rather than having a giant analog stick sticking out of the controller we thought the circle pad looked aesthetically more pleasing." Ergonomics and aesthetics may justify the switch to circle pads, but they rob the Wii U controller of the L3 and R3 inputs that the clickable sticks on the Xbox 360 and PS3 controllers have. The Wii U controller's touchscreen can compensate by simulating any buttons a competitor's controller has that the Wii U doesn't. But the exclusion of L3 and R3 is at least a signal that the Wii U, pitched by Nintendo as the first video game console that can be all things to all gamers, be they bowling grandmas or Call of Duty college kids, has limits. POKÉMON SNAG—The very capable Wii U controller includes motion sensors and an outward-facing camera, the latter of which is new to home video game controllers. If those features were used in combination, I initially imagined, they would allow the Wii U controller to work as a viewfinder. You'd be able to hold it up to a TV and simulate the experience of seeing "through" it and into a video game running on the TV. Imagine, for example, using it as a telescope or as a camera, as I suggested to Nintendo's Katsuya Eguchi, for a Wii U version of the camera-safari Nintendo 64 game Pokemon Snap (Hey, he was asking me if I had any Wii U game concepts). The gyro sensors in the Wii U can only tell the Wii U where the Wii U controller is facing compared to where it once was. To work in a camera game, it would first have to be calibrated vis a vis a spot on the screen and require re-calibration if it was ever pointed away from the TV. "The gyro [in the Wii U controller] can figure out where the player is pointing relative to a certain spot," Eguchi told me. "So it can find a center and relative to that is where the screen should display." This explains why Nintendo showed its own variation of my camera idea in the form of a rifle's sniper scope, one that mounted a Wii Remote and Wii U controller together. "The new Zapper," Eguchi said, referring to that contraption, "could combine a pointer with that gyro." Any controller has limits, right? In this case, that reality clashes with the marketing pitch. This Wii U controller is the one, we're told, that can enable so much. "This is a system for you, whether you are the most experienced, passionate gamer, or whether you are brand-new to gaming experiences," Nintendo of America president Reggie Fils-Aime told me last month as he described Nintendo's plans to get the best of all kinds of home video games onto the Wii U. "If we're able to do that we will have achieved something that hasn't been done before in terms of a platform that cuts across all genres, that cuts across all types of consumers, to deliver something truly meaningful." Happily, the actual console part of the Wii U does seem like it can fulfill Fils-Aime's and Nintendo's goal. It's expected to at least match and probably surpass the processing muscle of the Xbox 360 and PlayStation 3. And this controller should be able to map most control schemes, that L3/R3 issue notwithstanding. There's just this one, big problem: there's only one Wii U controller for each Wii U. Nintendo may have intimated to me and others a month ago that there will be more, but looking back on what they showed at E3 and parsing all of the company's statements since then, it is clear that Nintendo only intends the Wii U to use one screen controller. The omission of L3/R3 is not a catastrophe. That one-controller limitation, however, may be a system-crippling problem. It's a limit on the controller that hurts the system. The perfect Wii U would support multiple Wii U controllers. The Wii U at E3 did not appear to do so. The perfect Wii U would let me and you compete with each other from the same couch, a screen-centric controller in each of our hands. We'd be able to play Madden together and experience the much-discussed opportunity of being able to privately pick our plays on the screens of our controllers while competing in the game on our TV. We'd be able to play a new version of Four Swords Adventures a Zelda game on the GameCube that let four players share an adventure on a single TV screen but permitted each to descend their heroes into homes or caves rendered privately on the screens of their tethered Game Boy Advances. With the perfect Wii U, our heroes would descend into our Wii U controllers. The perfect Wii U would even let four of us compete in a split-screen shooter like the classic Nintendo 64 game GoldenEye but let each of us look at a map and manage our weapons with the touch-screens in our controllers. 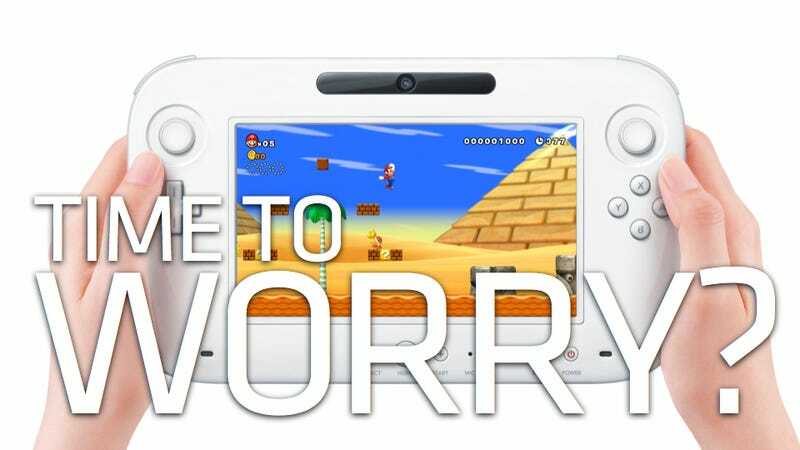 At E3, Katsuya Eguchi acknowledged that not one of the several demos of the Wii U used more than one Wii U controller. Forget about using four Wii U controllers to interact with one system. Even using two of these screen-based controllers with one Wii U is currently strictly experimental. "We're considering our options with maybe two screens," Eguchi told me. Eguchi's boss, Nintendo president Satoru Iwata, has said that Wii U owners will be expected to have just one Wii U controller. And when asked by Kotaku if Nintendo plans to make games for the Wii U that would use two of these controllers, Nintendo of America spokesperson Kit Ellis said, "We do not have any such plans right now, but in the future we could explore how two controllers might be used in game play and what new experiences that might introduce." Asked if Nintendo would even sell Wii U controllers separately, he said, "We will make such announcements later in each territory." The wisdom of supporting two Wii U controllers for each Wii U appears to be a victim of the realities of commerce and technology. It's unclear how much Nintendo's dazzling controller would cost, but it must be expensive. Remember that it includes a 6.2" screen, motion sensors, a camera, a mic, a speaker, several buttons, two circle pads, force feedback and a rechargeable battery. Nintendo isn't the kind of company to sell gear like that cheap. They like making money on what they sell and will cut corners to keep costs down or price things up to cover them, meaning the Wii U might have the muscle to support two controllers, but the Wii U controller might be too expensive for Nintendo to think you or I would buy a second one. And maybe the Wii U isn't powerful enough to do two or more controllers justice. Even if Nintendo's new console is more powerful than the PlayStation 3 and Xbox 360, could it manage to render a high-definition video game on a television, output more graphics to one controller and still have the juice to stream a third screen's worth of graphics to a third controller? Company president Iwata says it is, though Nintendo has refrained from showing that. The Screen and Screen-Not - Two people play. One person has a Wii U screen-controller. The other has a Wii Remote, maybe a Nunchuk or a Classic Controller (or a Balance Board? Anything!). The two players have different control experiences, one that is cutting edge and two-handed. The other uses control paradigms from the Wii, waving a Remote in one hand and maybe shaking a Nunchuk in the other. The non-screen player controls their part of the game while looking at the TV. The screen-controller player may be looking at the TV as well. Or they may keep their eyes on the screen of their controller, which could be displaying a private view of the game. Or they could be looking at the TV and the screen in their hands. While the two players' experiences will likely be distinct from each other, they could achieve a rough parity if the non-screen player used a Wii Classic Controller, which resembles a Wii U controller without a screen. This would give both players dual-analog control, though the screen controller person would still have access to a camera, rumble and motion control, which the Classic Controller lacks. The Pass-Around - As demonstrated by Nintendo with an E3 demo called Measure Up, a game would requires one player to do something with a Wii U screen controller—say, draw a perfect circle—then invites the player to pass the controller to another person so they can try to perform that task better. The No-TV-Required - Nintendo showed this in their Wii U concept video. People set the single Wii U controller on a table and play board games on it. The Wii HD player - Forget the fancy new controller. Armed with four Wii Remotes, which are compatible with the Wii U, four people play new versions of Wii Sports-style games, ignoring the new controller, keeping one of their hands free and enjoying the benefits of high-definition graphics for their Wii-style gaming. The Unlikely Nunchukers - This scenario is the closest one to offline multiplayer on the Xbox 360 and PlayStation 3. Again, forget about that Wii U controller. One to four people play the rare games that let them all use Wii Remotes and Nunchuks—maybe Classic Controllers if they so choose. Will this be the way for a group of friends to play Madden or any split-screen co-op or competitive shooters? Seven options. And counting. What a bundle of confusion Nintendo is making. If you were a game maker creating a new shooter, a new racing game or a new basketball game, which of these configurations would you plan for? If you were a gamer, which would you want? Which would you, as a Wii U owner, even have the gear to use? I've tried some of these Wii U multiplayer configurations, some of them, as I noted, when they got a dry run on older Nintendo hardware. I can confirm that they're fun. But they're not the way we play games against each other now. They're also confusingly varied. I can imagine major games made with any of the configurations I described. Any one of them could prove to be the prevailing Wii U multiplayer paradigm. Online Wii U gaming might be great, but the advantage of having a private secondary screen is diminished when your opponent, far away on the other end of an Internet connection, already can't see what's on your primary screen, your TV. And since when is the Wii brand of gaming about playing online? This is Nintendo's strange twist. The very image they crafted to define a new era of gaming with the Wii—a family playing at home on one TV—is incompatible with the new Wii U controller. After struggling through the later Nintendo 64 and GameCube eras, they rose again in the last generation of home consoles by painting a new group portrait of the gamer as smiling dad, chuckling grandma or joyful son standing in front of a couch gleefully playing a video game together. Rock Band matched this. Microsoft's Kinect co opted this. The Wii U's controller doesn't support this. Even if Nintendo doesn't have a huge problem with its one-controller Wii U, it at least has a new difference. Again. They had a difference after they ditched their mighty Game Boy brand and gambled on two-screened DS gaming. They had one a\fter they slowed the console graphics arms race and decided motion control was the new selling point. They were right both times and have piles of money and crowds of happy customers to prove it. Here comes another zigzag. Company leaders publicly relish all of these daredevil sharp turns they keep making, but isn't one of these going to finally send them off a cliff? 1) For all of Nintendo's vaunted differences, some of its biggest hits have succeeded despite them... see the Mario Kart and New Super Mario Bros. blockbusters on the DS that barely exploited that machine's two screens or the hit Smash Bros. and New Super Mario Bros. games on the Wii that barely used that machine's signature motion control. So those weird new features of each Nintendo system? Sometimes they play no part in propelling Nintendo's next hit games. 2) As limiting as the opportunities for game development may be on a Nintendo console that only supports a single signature controller at a time, other gaming devices with equally ludicrous tech restrictions are thriving. See Microsoft's Kinect, which requires a chunk of its consumers to rearrange their living rooms to enjoy it, apparently a minor obstacle en route to 10 million units sold, and counting. Microsoft notoriously excluded a hard drive from every Xbox 360 when that console launched, a cost-saving shortcut that was supposed to splinter the console's userbase. So much for that theory. The 360 is selling better than ever, with each unit now packed with enough memory to keep its customers happy. Maybe the Wii U's one-controller limitation will be as inconsequential as its omission of the L3 and R3 analog stick clicks. Maybe Nintendo runs little risk of moving away from the Wii model of multiplayer gaming. Perhaps couch gaming isn't the zeitgeist anymore. For all its faults, Nintendo is probably making the right gaming console for our times. Who sits on a couch with other people in order to all focus on the same thing anymore? Do people really gather to watch a TV show together or have dinner? Think about it. Is their attention undivided and on the same thing? Of course not. At least one person is checking their iPhone, logging onto Facebook, reading a text or sending an e-mail. The globally rich society that plays video games is the same globally rich society that in the year 2011 always already has a private screen in the palm of their hands. We are the people who Tweet while in public about the folks standing two feet away. We turn the private public and make the public private. We are constantly shrinking from the people next to us into the world of our own screens. Isn't it about time that we got a gaming console that let me sit next to you but ignore you, even though we're playing a game together? I'm playing it on my own screen in my hands, thank you very much! You and the other people in the room can keep on looking at the TV instead. I asked Nintendo's Katsuya Eguchi if he thought it would be a hassle for people to have to look down at the screen in their Wii U controller while playing a game that runs on their TV. He looked at me as if I was born in the previous century (correct!) and guessed that I've probably checked my cell phone once or twice while watching TV. Of course I have. Hey, this Wii U console is my kind of console, after all. It's a gaming machine for the perpetually-distracted Twitter generation. There's one other oh-so-modern aspect to the Wii U: it is a device of never-ending engagement. It pulls console games off the TV. That seems right to me. A little more than a decade ago I was marveling at the experience of talking on the telephone while walking down the street. Insane. I used to have to be home to make phone calls. In the last decade, I've watched TV shows in the palm of my hand while waiting for the subway. I've bought a comic book without leaving my house and suspended a movie over my face while lying on my bed. The only form of entertainment that I enjoy that stays on one screen, that won't travel with me even to the other side of the room, is home video games. Here comes the Wii U with its ability to run TV games on its controller's screen and to put those graphics back up on the TV with a simple switch. That is synced, uninterupted video gaming. That is modern. I expect the Wii U to be released in America in about a year, maybe a little less, maybe a little more. At this point, it seems as big a risk as Nintendo's ever taken, and I wonder why Nintendo is perpetually determined to court this kind of danger. They're dopes, they love danger or both. Perhaps Nintendo sees the massive threat posed to their portable gaming business by the increasingly-relevant and increasingly-popular portable gaming on the iPhone, iPad and Droid and recognizes the need to do something drastic in the home console wing of their industry. Perhaps they now believe what their critics said, that the Wii was a fad and have decided there's less profit in trying to replicate the Wii rather than do something brand new all over again. Perhaps they are screwing themselves if they think they can survive with a console that only supports one cool controller at a time. Or perhaps they've nailed it and concocted the ideal gaming console for a moment in our culture that is defined by the distracting appeal of personal screens as well as the insatiable appetite for entertainment that can't be turned off, can't be locked into one place. A month after the Wii U was announced, Nintendo remains as puzzling a video game company as ever. They may be right once again, but, you know, if they could support a second controller on the thing, that'd be nice and it would help this whole Wii U thing make a lot more sense.